Since its introduction last year, our 1.5 Inch Basket Strainer Waste has proved to be very popular, outselling the conventional Slotted Waste (Plug & Chain) by 150%. The majority of our Handcrafted Sinks require a 3 Inch Basket Strainer, but the Pendle and Belfast Sinks are fitted with a 1.5 inch accessory. Previously, the only 1.5 Inch option was the Slotted Waste Plug & Chain and while this traditional look is still very popular for these kitchen sinks, the elegance of the Basket Strainer Waste has enhanced the accessory range to provide customers with more choice than ever before. Our Basket Strainer Wastes are handmade in four colour options using the highest grade stainless steel and feature a ceramic indices with a bespoke Shaws insignia. To find out more, please view our Accessory Range by clicking the link below. 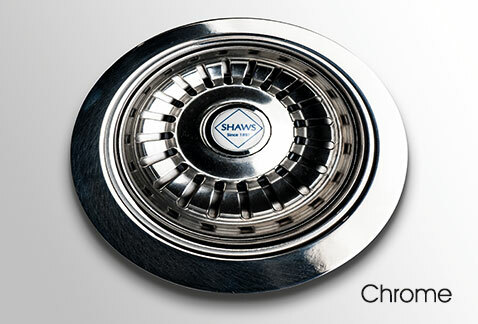 ARE YOU A PROUD OWNER OF A SHAWS OF DARWEN SINK?